It’s general knowledge that Jollof Rice, especially the Ghanaian prepared type, is one of the best foods that can be served to every hungry person. Jollof is one of the most sumptuous meals in some African countries, but Ghanaian Jollof Rice is known to be very special. 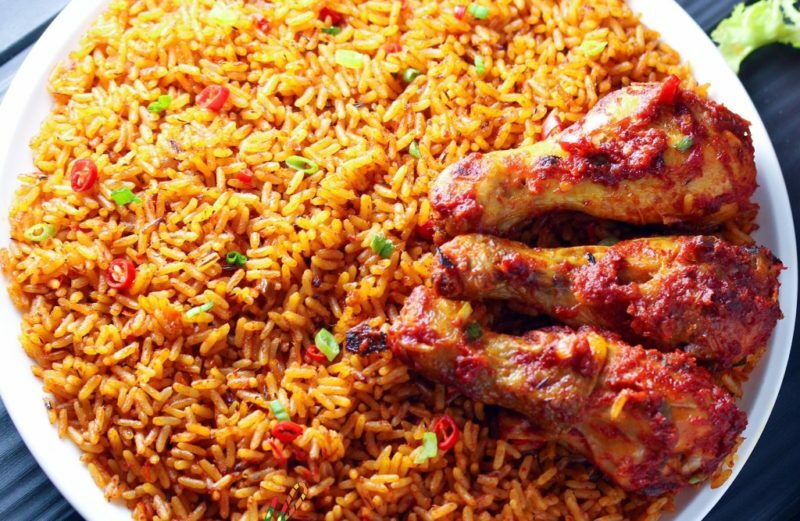 To provide further insights, Ghanatalksbusiness would like to take readers through the simple steps to prepare jollof rice the Ghanaian way this Easter season. Use the steps below to prepare Jollof rice the Ghanaian way. -Add the blended mix to the chicken; you can add a trusted brand of chicken season if you want. -Steam the chicken for about 8-10 min then allow it to cool. -To prepare your stew, Blend 2 bulbs of onion, ginger and pepper according to your preference. -Pour about 3 tablespoons of cooking oil into a saucepan, heat it up and fry the sliced onions and let it cook for 2 mins. -Add the blended mix of onions, pepper and ginger and let it cook for another 2 mins. -Add 4 tablespoons of tomato puree and stir the sauce until puree is evenly mixed. -Allow the sauce to simmer for about 15 mins. -When the steamed chicken is ready, strain out the stock and allow to cool. -Deep fry chicken till it gets the golden brown crusty look. Put the fried chicken aside. -You can either add your chicken to the stew or serve it separately when the Jollof rice is done. -Then Add the chopped vegetables and cook for a few minutes (scoop some stew out if preferred to be served with Jollof rice later). -Now, add the rice and a little water(depending on the amount of stew you have) and salt to taste. Cover the rice and reduce the heat to very low. -Check and keep stirring intermittently to avoid burning till rice is cooked through about 20 min. Finally, Dish out your rice into your serving plate and add your chicken, plus Salad or Gravy(optional) to the Jollof rice.